This was created for Halloween last year, but I am so proud of my creations then that I want to put them up again this year. I hope your sims enjoy these as much as mine. 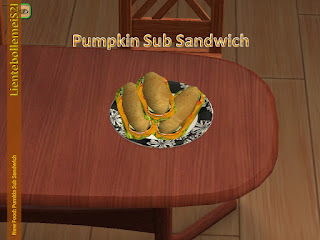 This delicious sub sandwich is great for your halloween parties. It's basically pumpkin slices, avocado, iceberg lettuce and carrots. It's cloned from the lunch meat sandwiches so it acts as such. This information is also included in the download. All my food will be created the same way, but I'm updating my other food uploads so the menu has the same structure for every food I make. Really high, but reduced (by TNW) where possible. - The poly counts are quite high: be careful with putting a lot of sandwiches in your sub store especially when you have an older computer. 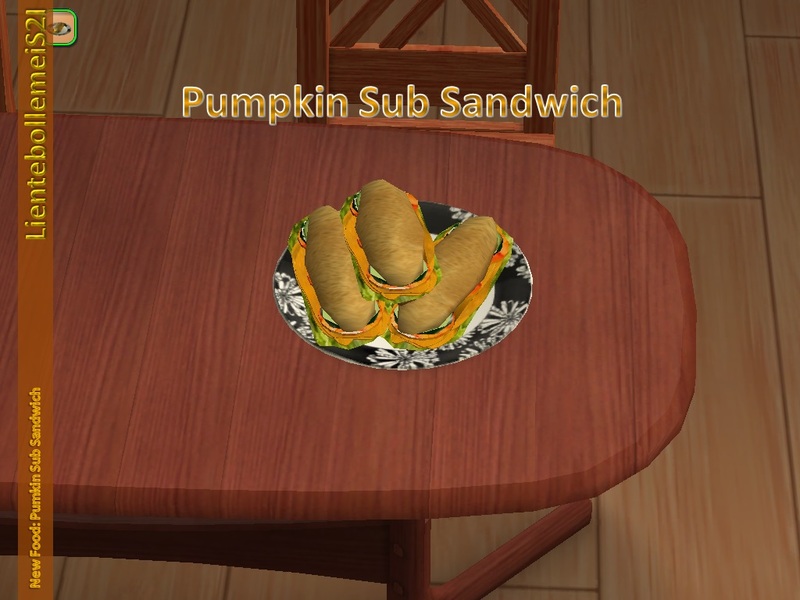 As this is cloned from lunch meat sandwiches there is a chance that your sims role a new want: "eating/preparing ... sub sandwich" like they role a want for the lunch meat sandwich. There is a chance that when your fridge is full with fresh ingredients the sub sandwiches sparkle (as they are also made with vegetables and fresh ingredients). When preparing a group meal the plate won't be empty when all the subs from the plate have been served. This is an error I can't help because I cloned this from lunch meat sandwich and the mesh TNW made. It also happens with the original sub sandwiches TNW made so I can't do nothing about it. Yes, I can, but I won't create them all as I'm not confident enough in the matter. The chance is very huge that you ask something I can't create. But if it's a clone from something I already made, I might be able to create your request, so just ask and we'll see. This food is quite simple to make if you follow my tutorial. I suggest you try it yourself. You can also do a suggestion and it might give me some ideas. Feedback always keeps a creator going for making more new stuff (in this case sub sandwiches).